Good morning, Everyone! Hope you all had a fantastic weekend! This is yet another one of those outfits comprised entirely of all of my favorite things at the moment. I’ve been searching for a perfect pair of pastel skinnies for ever, and the ones I’m wearing in this post are exactly what I’ve been looking for. I love pretty much everything about them! The tweed texture, the combination of white and soft pink, the fit and of course the length. Cause I don’t know about you, but I am not too keen on the idea of super long skinny jeans. Sure they look ok paired with pumps, but when I wear strappy heels I have to roll them which I think creates a bit of a bulky look. 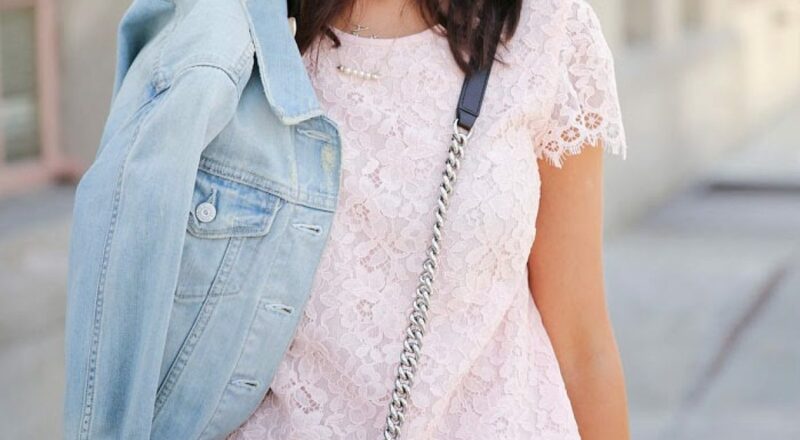 The lace tee I am sporting in this outfit is also a recent find and definitely one of my favorite items right now. I think I mentioned before, I always look for special details and textures, and lace combined with a slightly slouchy silhouette turns a basic tee into a real stand out piece. Finally, when I think about essential heels for summer, a pair of white strappy heels is always on top of that list. Surprisingly, a pair of white sandals is not so easy to find. You see, I was looking for something very simple I could wear with jeans or dresses, but with a fairly high heel. Most of the white heels I’ve been coming across lately had too much detail and embellishment, or had tiny or bulky heels I am not particularly fond of. That is of course until I spotted these amazing Saint Laurent Jane sandals. Simple and elegant, I can definitely pair them with pretty much anything and dress them up or down. And I don’t know about you guys, but for me, when it comes to shoes, versatility is key! Just love this pastel pink, gorgeous! I adore this look…pink and Chanel…what's not to love! I really adore this outfit! Such a lovely look! Want those pants! Love the pink ensemble and those sandals. Outstanding pants and sunnies! You look so chic! I love the lace detailing on the top. It's so true about finding a simple yet classy pair of sandals. Most of them have too much detailing on them. You look gorgeous! Gorgeous pink outfit! Loving these jeans! Flawless look! From the bag to the sandals, everything is perfect! Most beautiful lace top and love the pants. You look so pretty and girly. LOVE it. These pants are absolutely fantastic! I must have them!! You look great. The pale pink is so pretty on you, and WOW I really love the jeans, they're unique and really comfortable looking. Very chic!!! How can you always look so perfect? I love everything about this outfit!!! Beautiful outfit!!! LOVED your jeans!!! Your outfit is so pretty! I love pale pink in an outfit! Love those pants also! Reading your thoughts on your outfits and looking at your current and previous looks makes me want to get in touch with my feminine side more. You can only be grungy for so long until it gets boring. I love this top. Everything for the lace overlay to the colour! Your sunglasses are so on point too. Love how you mixed the two textures (lace and tweed). The strappy heels really make this an elegant and classy look. Love it! Great look! I love the monochromatic pink paired with the white sandal heels! Amazing pink color on the top! Love this outfit! Its so pretty! Love the pastel pink and white combo! I love your soft pastels. Absolutely gorgeous on you! Favorite Celebrity Hair of 2014 so far today on my fashion blog http://heavenisaplaceonline.blogspot.com/ Please check it out and leave a comment to let me know what you think! Follow and I'll follow back-I'm new here! OBSESSED with your perforated Boy Bag! Such a beautiful outfit! Looks so pretty and perfect on you! O X A N A M.U.A makeup blog NEW 'FIERY' POST! Such a cute look! Alway love a good monochromatic look!